Belle Harris Bennett, born to a wealthy Kentucky family in 1852, had a strong sense of egalitarianism and social justice; she was passionate about anti-racism work and full inclusion for women in the church. Through sheer tenacity, Bennett founded the Scarritt Bible and Training School to equip Christians for mission, in conjunction with the Woman’s Foreign Missionary Society. One of eight children in a close-knit religious family, it was in the church that Bennett found the opportunity to pursue her work for justice. In the late 1880s, Bennett felt called to create a training school for the southern Methodist church, a place where women who aspired to be missionaries could prepare for their work. In 1889, Bennett presented the idea to the Woman’s Foreign Missionary Society, which was excited by her idea and resolved that she should begin raising money. Though nervous, Bennett committed herself to the task and traveled over 20,000 miles over the next two years, raising funds. Despite last-minute opposition, Bennett persevered, and Scarritt Bible and Training School opened in 1892. 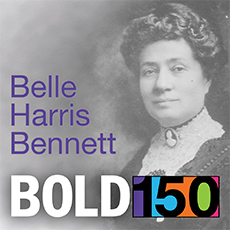 According to Elaine Magalis, author of Conduct Becoming to a Woman, Bennett was committed to addressing the concerns of African-Americans 10 years before it became an interest of the Woman’s Society. She began Bible study classes for black pastors, worked with black leaders to create a Chautauqua-style convocation for black men and women, and persuaded the Woman’s Home Mission Society to open an industrial school for black women in Augusta. Bennett holds the distinction of being the first woman to address a General Conference of the Methodist Episcopal Church South, in 1910. As early as 1902, Bennett was petitioning the conference to create an office of deaconess, and in 1910, when allowed to speak publicly, she spoke eloquently on behalf of the Woman’s Home Missionary Society, urging the conference to give full laity rights to women. Sadly, her petition failed then, as well as in 1914. The conference finally agreed to allow women to be elected to the conference in 1922, and Bennett was one of these, but she was too ill to attend. She died that year.